QUESTION: Dear Mister Armstrong, I have been pondering the thought of Mr. Tump actually welcoming a war with South Korea since Kim Jong Eng launched the first missile via the genesis of the Trump administration. If a war materialized would it not have a actual possibility of stinging China’s economy to a certain degree after all that was one of the main reasons why Trump ran for President “China is eating our lunch”!! Countless refugees would flood into South Korea undoubtedly, but I am a bit hesitant how far “North Korean refugees”would infiltrate as far as reaching the China? Alternatively at the time in question perhaps Kim Jong Eng would be terminated. ANSWER: From a timing perspective, 72 years from the birth of the 38th Parallel brings us right here to 2017. The War Cycle brings us to the last date being 2020.92. I doubt that China would allow any refugees to cross the border. Perhaps there will at least be some attempt to assassinate Kim Jong-il, but that is also a long-shot. The division of Korea between North and South Korea was the result of the allied victory in World War II in 1945, ending the Empire of Japan’s 35-year rule of Korea. The United States and the Soviet Union occupied the country, with the boundary between their zones of control along the 38th parallel. The United States supported the South, and the Soviet Union supported the North, and each government claimed sovereignty over the whole Korean peninsula. American troops occupy southern Korea, while the Soviet Union occupies the north, with the dividing line being the 38th parallel of latitude, which was established on September 8th, 1945 (1945,68). This arrangement proves to be the indirect beginning of a divided Korea which will lead to the Korean War in 1950. The Korean War (1950–1953) left the two Koreas separated by the Korean Demilitarized Zone (DMZ) in the later part of the Cold War and beyond. However, the collapse of the Soviet Union in 1991 deprived North Korea of its main source of economic aid. 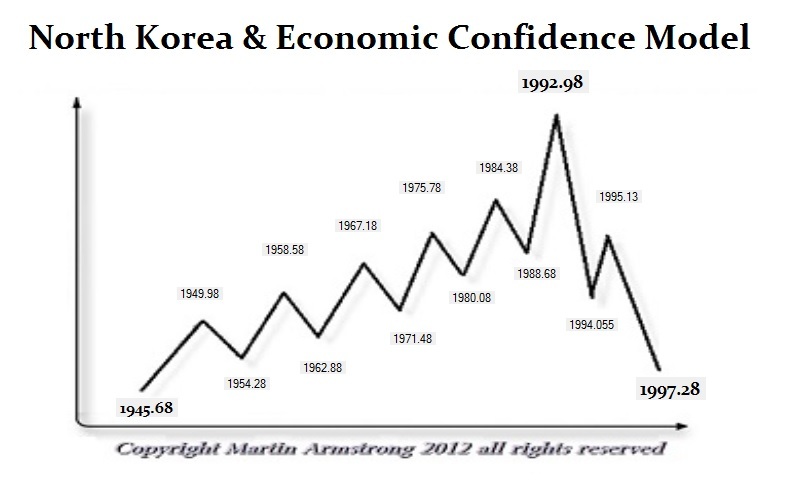 Without Soviet aid, North Korea’s economy went into an economic free-fall in 1992 pretty much in line with the Economic Confidence Model calculated from the birth of the 38th Parallel. By this time in the early 1990s, Kim Jong-il was already conducting most of the day-to-day activities of running of the state. Meanwhile, international tensions were rising over North Korea’s quest for nuclear weapons. Former US president Jimmy Carter made a visit to Pyongyang in June 1994 in which he met with Kim and returned proclaiming that he had resolved the crisis. However, Kim Il-sung died from a sudden heart attack on July 8, 1994, three weeks after the Carter visit. His son, Kim Jong-il, had already assumed key positions in the government, succeeded as General-Secretary of the Korean Workers’ Party. He needs to be a threat to the world to retain his power. If he every reversed so that all the sanctions would be removed, the people would most likely overthrow him. So for personal self-interest, he needs to keep a war posture. A war there would send the dollar higher against China. However, keep in mind that Congress is going insane with its sanctions against Russia and that too will alienate China.